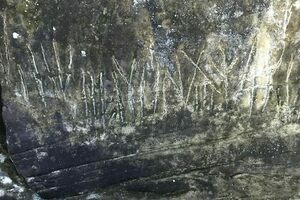 Etched onto a rock that’s part of a cliff overhang in Wyoming County, West Virginia, is a set of controversial petroglyphs. If you have the nose for seeking out the pockets of hidden history within the United States, then these incredible rock carvings will satisfy even the most reserved amateur archeologist. The Luther Elkins Petroglyph, also known as the "Lynco," "Lillyhaven," or "Horse Creek" petroglyphs, are located at the base of a steep hill overlooking the bottom of the upper Clear Fork of the Guyandotte River. Though their age and meaning are unknown, they’re widely attributed to the Algonquian peoples. But there are some who think the rock art was the work of a foreign hand. Archaeological conspiracy theorists believe these prehistoric markings were created not by the area’s indigenous inhabitants, but by Irish monks. The conspiracy was sparked in the early 1980s, when a few articles were published claiming that the petroglyphs were Christian messages carved in the early eighth century. The theory proposes that the glyphs are actually written in Ogham, an old Irish alphabet.